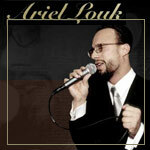 Whether it is a small intimate gathering or a large gala event, you can trust Ariel Louk and Orchestra to provide the perfect musical ensemble to suit your special occasion. Get more for your wedding! Don't forget to mention ChossonKallah.com when visiting Ariel Louk & Orchestra. Attended the dedication of a Torah in Flagstaff a couple of months back and Ariel was there with several members of his musical group - FANTASTIC! Ariel was our musician at our daughter's Bas Mitzvah. Not only is he talented...but he is a nice guy and a pleasure to work with ! !